Standing on a meadow in front of a mountain backdrop are two high posts, connected by a taut rope, with a dog balancing between them, while overhead clouds drift by. After a couple of steps the dog folds in its forelegs and appears to get ready to kowtow, but immediately leaves this position again and retreats, transfers its weight onto its hind legs and begins to perform the very same sequence of movements again. The animal is haloed by a sparking yellow nimbus—an indication that the rope is possibly electrically charged, although this seems to have no detrimental effect on the dog’s acrobatic skills. The animated video loop is identifiable as a work by the American artist Jonathan Borofsky (b. 1942 in Boston, MA) thanks to the eye-catching sequence of seven numbers positioned in the center of the lower section. As if keeping track of how many frame settings make up the animated sequence, the numbers run from 2,671,428 through to 2,671,481 synchronously with the movements of the dog on the rope, back and forth. In this spirit, artists like Agnes Martin, Eva Hesse, Sol LeWitt, and Robert Rauschenberg had experimented since the 1960s with the autonomy of the medium, which no longer remained an exploratory tool, merely the sketched precursor to a work still to be completed. At the same time, the emancipation took place in a reciprocal exchange with other art forms, with Eva Hesse for example “mixing the processes of drawing and sculpting.” Borofsky’s interest in animated film can thus also be located within the diversification of contemporary drawing practices in the United States. In contrast to his drawings, installations, and monumental sculptures in public space, outside of inventory catalogues his video works have hitherto attracted little attention. Although relatively small in number, they represent an undoubtedly notable part of his extensive oeuvre, not least because Borofsky taught at the California Institute of the Arts between 1977 and 1980, alongside fellow-artists like John Baldessari and William Wegman, and was thus connected with one of the liveliest contemporary experimental video art scenes. In the 1970s, two programs were founded at the Institute: Experimental Animation and Character Animation. But courses on Animation Production Techniques were also offered at the School of Visual Arts in New York, where Borofsky had been a teacher immediately prior, from 1969 to 1977, attended for example by the painter Maria Lassnig before she created her animated films. 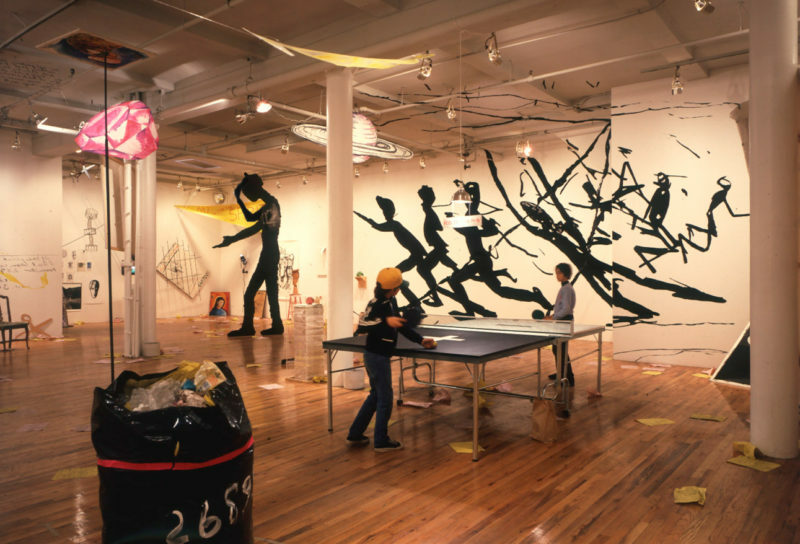 While Borofsky was seen as a representative of Neo-Expressionism in the 1980s, his explicitly personal, spiritual subjects represented the breaching of a taboo, causing him to retrospectively assume a unique position in the American art scene of the 1970s and 80s. In their continuation of these enigmatic themes, already deliberated on in the medium of drawing, and their refusal to indulge in crafted virtuosity, his videos contribute decisively to this perception. To contextualize them against the backdrop of the contemporary development of (artistic) animated film would extend the reception of Borofsky’s work, hitherto centered primarily on the subject matter, by adding a historical dimension, namely that of media technology and institutional settings. Cf. Lucy Lippard, “Jonathan Borofsky at 2,096,974,” Artforum, vol. 13, no. 3 (Nov. 1974), 63–64, here 64. Cf. 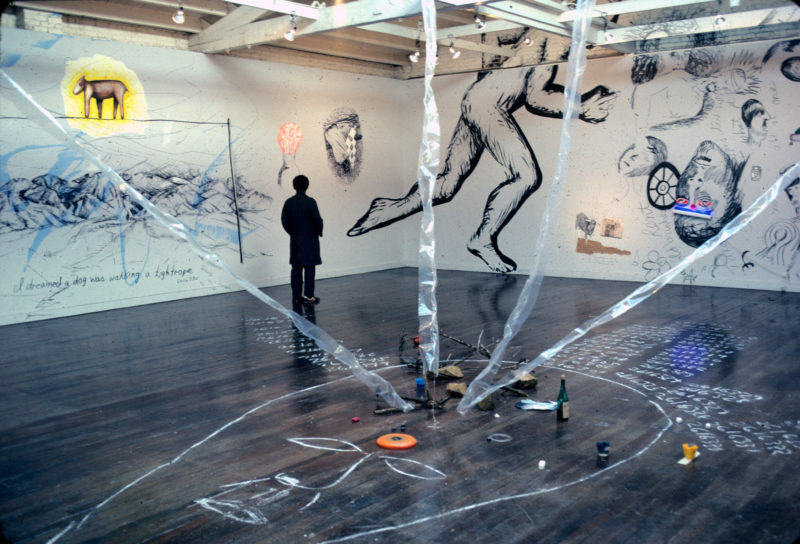 Richard Marshall, Jonathan Borofsky’s Installations. All is One, exh. cat. Stockholm 1984, 87–104, here 90. Pierre Bourdieu has pointed out the fictive dimension of the biographical chronology as a linear narrative of a life story: “L’illusion biographique,” Actes de la recherche en sciences sociales, 62–63 (June 1986), 69–72. Richard Armstrong, “Comparing Notes with Jon Borofsky,” exh. cat. Jonathan Borofsky, Moderna Museet, Stockholm, September 8 to October 21, 1984, Uddevalla, 1984, 109–117, here 109. A reproduction is to be found in the exh. cat. Jonathan Borofsky. Dreams 1973–81, Kunsthalle Basel, July 12 to September 13, 1981, Institute of Contemporary Arts, London, October 9 to November15, 1981, London, 1981. The drawing was shown for example at the Portland Center for the Visual Arts, Portland, Oregon, 1979. Borofsky is said to have gotten the idea to draw directly onto the walls from Sol LeWitt. Cf. Michael Austing in mus. cat. Modern Art Museum of Fort Worth. 110, ed. Michael Auping, London, 2002, 219. One example is his Self-Portrait with Big Ears (Learning to Be Free) in the exhibition Westkunst. Exh. cat. Westkunst. Zeitgenössische Kunst seit 1939, Rheinhallen, Cologne, May 30 to August 16, 1981, Cologne, 1981. Referring to the animated films of William Kentridge, Rosalind Krauss has spoken of how his interest in the medium of film arose out of the processuality of the “graphic medium”: “[A]nimation here—the run-on projection of the frames recording successive phases of the drawing which thereby generates the sense of a single work in motion—is a kind of derivative of drawing.” Rosalind Krauss, “‘The Rock.’ William Kentridge’s Drawings for Projection,” October 92 (Spring 2000), 3–35, here 9. Due to the ongoing succession of numbers in the Tightrope video, a similar interest is identifiable in Borofsky’s work, stemming from drawing rather than video. Bernice Rose (ed. ), exh. cat. Drawing Now, January 23 to March 1, 1976, Museum of Modern Art, New York, 1976, 14. Catherine de Zegher, “Die Befreiung der Linie. Zeichnung und Subjektivität vom 20. Jahrhundert bis in die Gegenwart,” Räume der Zeichnung, eds. Angela Lammert, Carolin Meister, and Jan-Philipp Frühsorge, Nuremberg, 2007, 189–211, here 199. With Ballerina Clown (1990), which Peter and Irene Ludwig bestowed on the newly founded institution in 1991, the Ludwig Forum in Aachen also possesses a sculptural work by Borofsky. Cf. Michael Rush, “Jonathan Borofsky. Man in Space. 1982–1983,” mus. cat. Collection Nouveaux Médias Installations. La collection du Centre Pompidou Musée national d’art moderne, Paris 2006, 102–103. Cf. Gregory Battcock (ed. ), New Artists Video. A Critical Anthology, New York 1978. See also exh. cat. Reel Work. Artists’ Film and Video of the 1970s, Museum of Contemporary Art, Miami, February 24 to May 2, 1996, Miami, 1996. Cf. Maureen Furniss, Animation. The Global History, London, 2017, 318. Cf. Manuela Ammer, “‘Be aware, be aware, be aware.’ Obacht vor Maria Lassnigs Filmen,” Parkett 85 (2009), 102–109. On Maria Lassnig’s time in New York and her drawings created there while exploring the new visual media, see Barbara Reisinger, “Drawing, Bodies, Television. Maria Lassnig and the 1970s in New York,” exh. cat. Maria Lassnig. Dialogues, Albertina, Vienna, May 5 to August 27, 2017, Kunstmuseum Basel, May 12 to August 26, 2018, Munich, 2017, 37–47. Cf. Jonathan Borofsky, exh. cat. Philadelphia Museum of Art, October 7 to December 2, 1984, Whitney Museum of American Art, New York, December 20, 1984 to March 10, 1985, University Art Museum, Berkeley, April 7 to June 16, 1985, Walker Art Center, Minneapolis, September 13 to November 3, 1985, The Corcoran Gallery of Art, Wash., D.C., December 14, 1985 to February 9, 1986, Philadelphia, 1984, 179. The animation of Borofsky’s video work Giraffe/Escalator (1988–95), shown in the exhibition curated by Bernice Rose, Allegories of Modernism. Contemporary Drawing (February 16 to May 5, 1992, MoMA), was created using rotoscope. (The exhibition checklist is accessible online at: https://www.moma.org/documents/moma_catalogue_360_300064453.pdf [accessed September 4, 2017]). Christine Tamblyn, “Manifestations of Thought. The Borofsky Exhibition,” The UC Berkeley Graduate Assembly Newsletter, August 1985, 1. Christine Tamblyn papers, MS-F11 Special Collections and Archives, The UC Irvine Libraries, Irvine, California [accessed August 30, 2017]. In a conversation with Udo Kittelmann, Borofsky says: “So I get very specific with my art and try to discuss human issues either through my dreams or through political statements or humanistic statements, because it’s the best I can do. […] I start with myself and put out into the world my own lessons, my own search for freedom.” Udo Kittelmann, “Jonathan Borofsky and Udo Kittelmann. A Conversation,” idem. (ed. ): Jonathan Borofsky. Dem Publikum gewidmet, Ostfildern bei Stuttgart 1993, 82–95, here 86. Jayne Pilling, “Introduction,” idem. (ed. ): Women and Animation. A Compendium, London, 1992, 5–7, here 5.